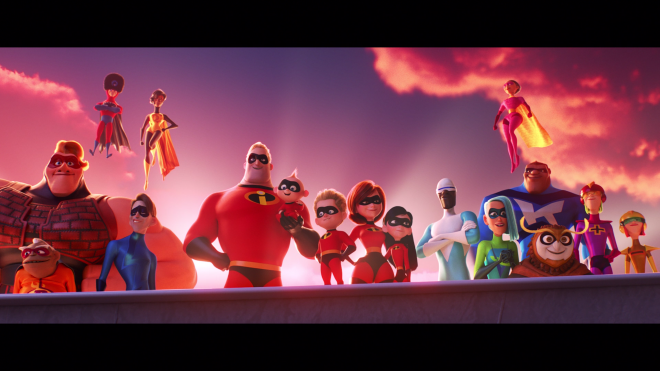 Picking up precisely where the first movie left off, Incredibles 2 is a delightfully jubilant and satisfying follow-up to Pixar's now-classic animation flick paralleling superheroes with middle age responsibilities. 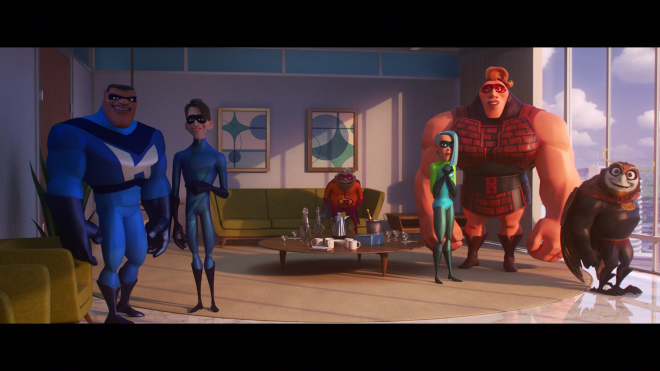 The end of the first movie seemed to suggest the end of a law that criminalized superheroes when the Incredibles family unite to battle the Underminer. However, the start of this sequel, which was written and directed by Brad Bird (The Iron Giant, Mission: Impossible – Ghost Protocol), quickly reminds audiences that Supers are still outlawed from performing any heroic acts, immediately setting the stage for the plot. On the one hand, this all feels familiar with our central heroes (Craig T. Nelson and Holly Hunter) once again combating an arguably unjust law and an apprehensive society. But on the other hand, Bird undermines these expectations with some challenging notions about modernity, taking them in interesting directions not commonly seen in a family animated film. The most obvious of Bird's ambitious ideas is the story's villain, Screenslaver, a rather creepy and frightening personality whose deeper conceit and meaning are deliberately unmasked less than halfway into the story. Even from the character's "nowhere near subtle" name, it's clear Bird doesn't want moviegoers mistaking the baddy's intentions and symbolic role. The evildoer literally announces he's wreaking havoc throughout the city for the sole purpose of exposing society's dependency on digital technology and the endless number of screens everywhere. Further engrossing us, Bird expands on this when the mastermind behind Screenslaver is finally revealed, connecting it back to the view of outlawing superheroes and their effect on society, both the negative and positive. The grander picture is a concern for the overreliance on others and technology to solve one's problems, a mature concept kids rarely hear about let alone discuss with the adults in their lives. 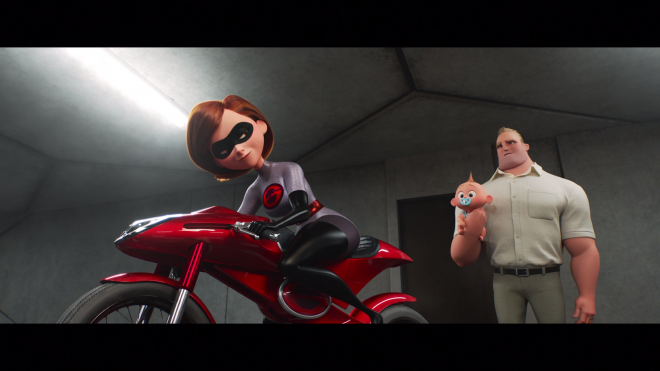 Even more fascinating is seeing these ideas explored in the Incredibles family, especially after Hunter's Elastigirl accepts a new job of super crimefighter for wealthy siblings Winston (Bob Odenkirk) and Evelyn (Catherine Keener) Deavor. In the first movie, Nelson's Mr. Incredible enjoyed the spotlight while Elastigirl hung her suit to become a super mom, and in the sequel, the roles are reversed, given Mr. Incredible a new perspective on being a stay-at-home parent. As super toddler Jack-Jack discovers a myriad of special abilities he can't control, which quickly and jokingly escalates into Mr. Incredible's greatest foe, Violet (Sarah Vowell) faces the sad realities of the teenage world and Dash (Huckleberry Milner) introduces our hero to Math. At the same time Elastigirl struggles with capturing Screenslaver, she grapples with her family no longer relying on her for their every need. Of course, none of this is as openly expressed as Screenslaver's goals, but it's all falls in line with the plot's overall theme, subtle as it may be. It's also interesting to see how far we've come nearly fifteen years later since the first Incredibles movie where much of the attention was on Mr. Incredible's mid-life crisis while keeping to traditional gender roles. 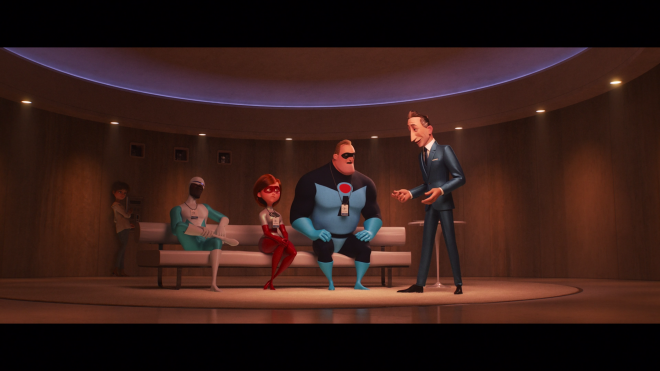 In Incredibles 2, the filmmakers shine the spotlight on the women of this universe, showing them just as capable as their male counterparts in every capacity while also subtly suggesting they perhaps can do it better. When Mr. Incredible fights bad guys, it's an utter display of mayhem and destruction, and even said bad guys, like the Underminer, leave a city in near ruins. Elastigirl, on the other hand, makes as little mess as possible and does a great deal of detective work to find the villain, thanks, in part, to genius inventor Evelyn and her countless array of innovative gadgets. It all makes for a surprisingly smart sequel with an understated theme masked by dazzling, ironically hypnotic action visuals and a terrific blend of humor guaranteed to satisfy the whole family. 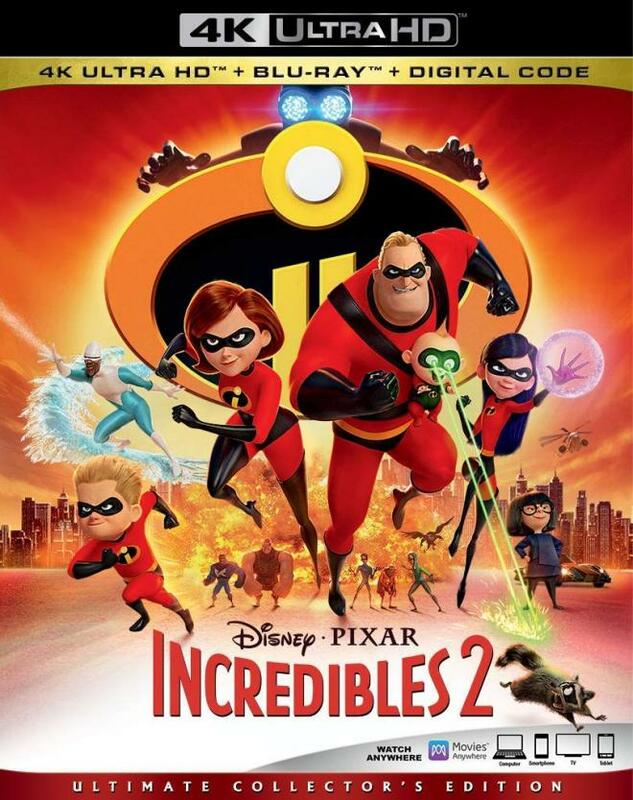 Walt Disney Studios Home Entertainment brings Incredibles 2 to 4K Ultra HD Blu-ray as a three-disc combo pack with a flyer for a Disney Digital Copy, dubbed "Ultimate Collector's Edition." When redeeming said code via RedeemDigitalMovie.com or Movies Anywhere, owners have access to the 4K UHD digital version in Dolby Vision HDR with Dolby Atmos. The dual-layered UHD66 disc sits comfortably atop a BD25 disc containing all the supplements while a Region Free, BD50 disc sits on the opposing panel. All three are housed inside a black, eco-elite case with a lightly-embossed, glossy slipcover. At startup, viewers are taken directly to a menu screen with full-motion clips and music playing in the background. Supers break the law along with cultural norms on 4K with a remarkable and often dazzling HEVC H.265 encode, showing several appreciable improvements over the Blu-ray. Sadly, overall definition is not one of them. Sourced from a 2K digital intermediate, the upscaled transfer is ultimately not any sharper than its day-and-date 1080p peer. To be sure, the picture enjoys a very mild uptick, however small it may be. Nevertheless, every nook and cranny decorating the background is plainly visible from beginning to end while the stitching and fabric of costumes and clothing remain striking with a couple moments nearing photorealism, such as Evelyn's fuzzy sweaters and scarves or Frozone's puffs of snow. Action sequences maintain superb clarity as individual bits of debris and electrical sparks fly in every direction. The 2160p video also arrives with outstanding, spot-on contrast, making for a slightly brighter and more energetic picture throughout. From Frozone's ice to the hypnotic glow of the many digital screens, whites are continuously radiant, supplying some aspects of the animation with stunning realism, such as the puffy, cotton-like clouds. Specular highlights offer another dramatic improvement, providing the brightest areas and moments with an excellent crispness and detailing, most notably when Violet projects force fields, He-Lectrix shoots electrical currents and in the rings around Voyd's wormholes. Meanwhile, brightness levels remain about the same as the HD version, which, don't get me wrong, remain inky-rich and luxurious. However, a case could be made that blacks seem a tad silkier and more satiny, bathing the 2.39:1 image with velvety, pitch-black shadows and a beautiful, cinematic three-dimensional quality. The best and most significant aspect of the Ultra HD presentation is, without a doubt, the exquisitely sumptuous color palette, lavishing every scene with mesmerizing and jaw-dropping beauty. Immediately, the primaries are significantly richer, showering the action with a fantastic parade of various reds, from the cherry pop of the Incredibles' costumes and the glossy candy rose of the Elasticycle to the crimson ruby of emergency lights. At the same time, greens are more of a spirited neon shooting from Jack-Jack's eyes while the blues in He-Lectrix's lighting shocks are an eye-squinting electrifying cobalt, and Frozone's ice show an arctic cerulean shade with a bit of teal. Better still are the deep, violet purples in Violet's force fields and in the fiery orange, marigold honey of explosions and Reflux's lava vomit. However, my favorite and most gorgeous sequence is, hands down, Elastigirl chasing the runaway hover train where the evening sky is bathed in lush lavenders and magentas while the clouds radiate a dramatic hot pink, making them look like cotton candy. With this fantastic Dolby Atmos soundtrack, the House of Mouse seems poised to rectify its streak of bad and questionable home audio mixes. Although not as aggressive or persuasive as the visuals might imply, the object-based track is nonetheless an effective and highly-satisfying improvement over its DTS-HD counterpart. Rear activity is a near constant with a variety of subtle effects discretely filling the surrounds for an enjoyable 360° soundfield during the wildest and most chaotic action sequences. Many of those atmospheric noises travel into the ceiling channels and loudly echo throughout the room, nicely enveloping the listening area. Possibly the best moments are those with Jack-Jack discovering his powers, particularly his teleporting through different dimensions and his giggling voice flawlessly pans overhead from one side of the room to the other. Breaking several chunks of silence, these scenes are actually demo-worthy, generating a great hemispheric environment that will impress anyone. 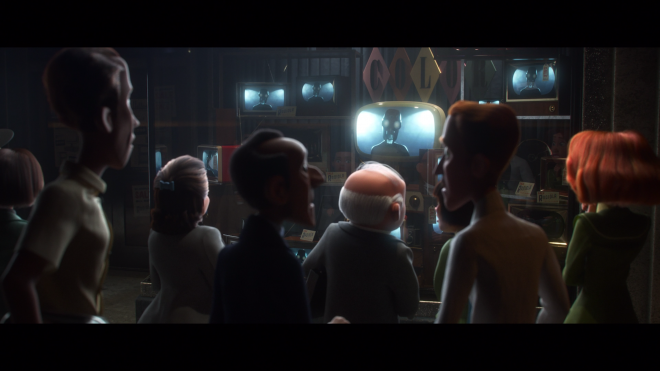 Audio Commentary: Writer and director Brad Bird is joined by animation supervisors Alan Barillaro, Tony Fucile, Dave Mullins and Bret Parker. The group of animators talk frankly about various aspects of the production, the visual design and the plot's themes. Strong Coffee: A Lesson in Animation with Brad Bird (HD, 19 min): Cast and crew interviews praising the filmmaker's work on this production, his talents and his career while also sharing their individual input, mixed with lots of BTS footage. "BAO" (HD, 8 min): The same animated short about a dumpling that comes to life as a boy and played at the start of the movie in cinemas. "Auntie Edna" (HD, 5 min): A new animated short with Edna babysitting Jack-Jack. Heroes & Villains (HD, 26 min): A collection of eight shorter pieces showing cast & crew talking about the personalities of various characters. Paths to Pixar: Everyday Heroes (HD, 12 min): Discussion on balancing career with parenting responsibilities on how the Incredibles family accurately reflects this. Super Stuff (HD, 7 min): A closer look at the retro design of this incredible world. Making "BAO" (HD, 6 min): Writer and director Domee Shi talks about the short film. Vintage Features (HD, 6 min): An assortment of faux vintage TV toy commercials and three character theme songs. Superbaby (HD, 5 min): A unique hybrid piece with a hip-hop video feel about creating the Jack-Jack character, hosted by Frankie and Paige of Disney Channel’s Bizaardvark. Ralph Eggleston (HD, 2 min): A chat on the production designer's influence on the film. Deleted Scenes (HD, 40 min): A set of excised sequences with an intro by the director. Trailers (HD, 9 min): Three theatrical previews followed by one amusing promo. Super Scene Breakdowns (HD, 21 min): The animators take a closer-look and discuss the making of specific scenes: Elastigirl and Raccoon Fight. Easter Egg (HD, 7 min): Brad Bird shares a story about a raccoon with the crew. The Coolest Guy in Showbiz! (HD, 2 min): Very brief background on Samuel L. Jackson. Picking up precisely where the first movie left off, Incredibles 2 is a delightfully jubilant and satisfying follow-up to Disney/Pixar's now-classic animation flick. Craig T. Nelson, Holly Hunter, Sarah Vowell and Samuel L. Jackson reprise their roles for another adventure through mid-life adulthood where the parents switch roles and the Incredibles family learns about self-reliance. The Ultra HD Blu-ray saves the day with a gorgeous 4K HDR10 video presentation and a demo-worthy Dolby Atmos soundtrack, a feast for the eyes and ears for the whole family. Packing a wealth of supplements, the overall package is a Highly Recommended winner for fans of the franchise and makes for a strong rental for the curious.